Box, the Silicon Valley darling that has disrupted enterprise Cloud storage and file sharing, will broaden its scope into the content-creation space with a new online note-taking application. Box Notes, to be unveiled on Monday at the company's BoxWorks conference in San Francisco, will provide a word processor-like interface where colleagues can add content to the document and co-edit it in real time. The application, which will be a standard component of the Box product, is in a limited test release. Interested testers need to request access by signing up at Box.com/notes. The company is looking at next year for releasing it in final form. "This is our first step into content creation and productivity [software]," said Chris Yeh, Box's senior vice president of product and platform. The goal of Box Notes is to help people capture information and share it with others easily. Box will likely develop more content creation and collaboration tools. As with Box Notes, it will try to make them in a way that they don't overwhelm users with an excess of features, Yeh said, echoing a common complaint against the Microsoft Office applications. The move potentially opens another front in Box's competitive battle against titans like Google and Microsoft. Box's flagship cloud service competes against Google Drive and Microsoft's SkyDrive and SharePoint. 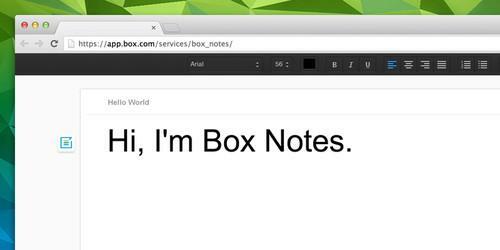 Box Notes sounds like it could be a rival to Microsoft's Word and OneNote, and to Google's Docs and Keep. Note-taking application vendors like Evernote also need to pay attention. It could also be a differentiator for Box against file share and storage competitors. However, Yeh said his company views it primarily as a tool designed to increase the value of its product for its customers. "The starting notion is that within the Box environment this can serve as a self-contained, collaborative note-taking product that allows for notes to be securely stored," he said. In July, Forrester Research ranked Box as the strongest vendor in the enterprise computing category the research firm calls File Sync & Share, ahead of offerings from players including EMC, IBM, Citrix, Dropbox, Google and Microsoft. In its evaluation, Forrester took into account criteria like current support for mobile devices, deployment flexibility, administration controls, security features, sync capabilities, integration with third-party systems and document viewer capabilities. Forrester also factored in the vendors' strategy and how well it positions them for future improvements and growth, as well as their market presence. A question is whether Box's foray into content creation tools will distract it from the laser-beam focus it has had on file sharing and cloud storage for businesses since its founding in 2005. In other words: why mess with success? Box's product, which can be accessed from computer browsers and mobile apps for all major platforms, is now used in 180,000 businesses, including 97 percent of the Fortune 500, and by about 20 million people. The company said recently that it's on pace to more than double its revenue in its current fiscal year, after posting sales growth of more than 150 percent in the previous one. Box has raised more than US$300 million in funding from investors like Draper Fisher Jurvetson and Andreessen Horowitz. CEO and co-founder Aaron Levie has said he may take the company public next year or in 2015. Alan Lepofsky, an analyst with Constellation Research, is optimistic about the company's move, saying that it's a good next step for Box, which has done a good job making it easy for people to share and "have conversations" around files. "Box Notes is a major step at making Box a more collaborative environment where colleagues can create and collaborate around content right from within Box itself," he said via email. "I expect Box Notes will also provide a nice boost to Box's partner ecosystem, as they will now be able to create add-ons similar to those available for Evernote." In addition to the real-time, concurrent editing, Box Notes will display collaborators' profile pictures so people can see who is working on a document at any particular time. Box Notes will also let users add annotations and comments to the documents, which in turn can be shared with other collaborators via a URL link. Documents created with Box Notes exist within the Box core infrastructure and are thus protected with its existing set of security features, access controls and account settings. Soon, Box will add Notes to its iOS and Android applications, thus extending its functionality to tablets and smartphones. Also in the works is the ability to embed rich media content on documents, such as photos, videos and audio. Other features in the pipeline are version history, including the ability to revert to earlier versions of a document, and offline editing. The unveiling of Box Notes isn't a complete surprise, since Box officials have been saying for several months the company wants to get into collaboration apps. "We have a very long roadmap around collaboration and [file] sharing and how people can work with their data and content," Levie told IDG News Service in July. "We're very early on that roadmap. What you see today is not how the product will look in six or 18 months." Two recent acquisitions give an idea of what might follow Box Notes. One is the acquisition of an unreleased application called Folders designed to give iPhone and iPad users a mobile front-end interface for Box as well as for competitors Google Drive and Dropbox. Box officials have said that the Folders technology will be meshed with Box's iOS application and upgraded later this year. Folders includes a PDF viewer, a music player, document, photo and video viewers, a photo and video recording tool and the capability to create and edit notes. The other acquired company is Crocodoc, whose HTML5 technology Box plans to use to improve the way documents stored on its service are rendered for viewing, replacing its existing document preview feature.